Greek graffiti on a fragment of a shoe from a relief representation of the Achaemenid ruler Darius I. Palace of Darius I (Tačara), Taḵt-e Jamšid (lit. "Throne of Jamšid"). Pārseh (Persepolis), Fārs province, Iran. Ca. 510-500 BC. Found by E. Herzfeld, 1923. The Metropolitan Museum of Art, Rogers Fund, 1945 (45.11.17). H. 0.083 m, L. 0.15 m, W. 0.06 m.
The limestone fragment was collected by Ernst Herzfeld at Persepolis during his early explorations in Iran and was kept in his private collection until it was sold to the Metropolitan Museum of Art in 1945 (Herzfeld 1935: 73-74, pl. X [left]; idem 1941: 251, pl. LXXII; Richter 1946: 28, 29 fig. 26). It is certain that it comes from a shoe of the relief of Darius in the west jamb of the west entrance to the private area in the north of the palace of Darius (Schmidt 1953: pl. 140 B; Tilia 1978: 56; Nylander and Flemberg 1981/83: 58-59 [Nylander]). Herzfeld reported that the drawings on the fragment were made 'before the shoe was painted red' (Herzfeld 1941: 251). 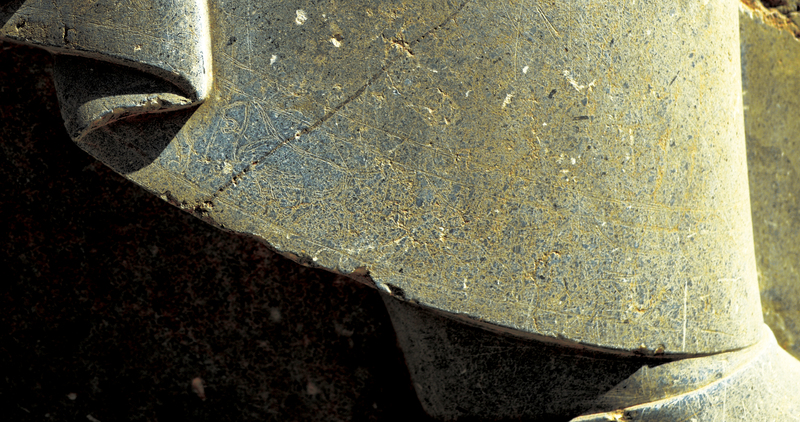 No traces of paint are visible with the naked eye on the fragment today (Dusinberre 2005: 145-146; cf. 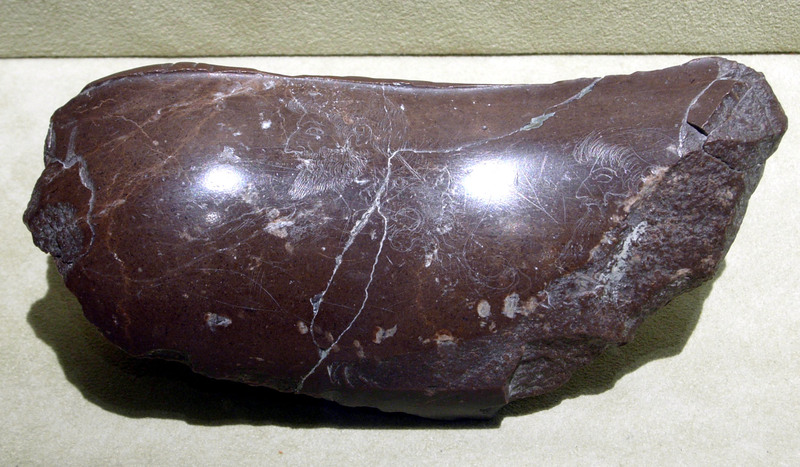 Nagel 2010: 107 n. 87). Taken as a whole, the composition does not belong to the repertory of the (clearly officially determined) decorative motifs attested on Persepolitan sculpture, and was evidently not meant to be seen. As Richter suggested, the drawings may have merely served to give vent to their artist's 'sudden desire to work in his own manner, untrammeled by the restrictions imposed on him' (Richter 1946: 28). Achaemenid documents refer to the involvement of groups of workmen from different subject regions of the Persian empire in Achaemenid monumental construction. References in these documents to Yaunā ('Ionian') workmen presumably allude to Greeks, sometimes specifying the tasks to which they were assigned (e.g., Kent 1953: DSf; see also, e.g., Rollinger and Henkelman 2009). Certainty about the part that the unknown artist of the present graffiti played in the realization of Darius' monumental sculptural project at Persepolis is unattainable. The quality of his designs, however, and the occurrence of his graffiti on a representation of the Persian king have been taken to imply that he was entrusted with the painstaking task of rendering with incised and then painted motifs the elaborate surface decoration of this royal figure, if not also with the carving of the entire relief (Nylander and Flemberg 1981/83: 58-61 [Nylander]). Boardman, J. 2000. Persia and the West. An Archaeological Investigation of the Genesis of Achaemenid Persian Art. New York. Dusinberre, E. R. M. 2005. 'Herzfeld in Persepolis.' In Gunter, A. and Hauser, S. (eds. ), Ernst Herzfeld and the Development of Near Eastern Studies, 1900-1950. Leiden and Boston: 137-180. Herzfeld, E. 1935. Archaeological History of Iran. The Schweich Lectures of the British Academy, 1934. London. ——. 1941. Iran in the Ancient East. Archaeological Studies Presented in the Lowell Lectures at Boston. London, Boston, New York. Moore, M. B. 2008. 'The Hegesiboulos Cup.' Metropolitan Museum Journal 43: 11-37. Nagel, A. 2010. Colors, Gilding and Painted Motifs in Persepolis: Approaching the Polychromy of Achaemenid Persian Architectural Sculpture, c. 520-330 BCE. PhD Thesis. University of Michigan. Nylander, C. and Flemberg, J. 1981/83. 'A foot-note from Persepolis.' Anadolu – Anatolia 22: 57-68. Richter, G. M. A. 1946. 'Greeks in Persia.' American Journal of Archaeology 50: 15-30. Rollinger, R. and Henkelman, W. F. M. 2009. 'New observations on "Greeks" in the Achaemenid empire according to cuneiform texts from Babylonia and Persepolis.' In Briant, P. and Chauveau, M. (eds. ), Organisation des pouvoirs et contacts culturels dans les pays de l'empire achéménide, actes du colloque organisé au Collège de France par la ‘Chaire d'histoire et civilisation du monde achéménide et de l'empire d'Alexandre’ et le ‘Résau international d'études et de recherches achéménides’ (GDR 2538 CNRS), 9-10 novembre 2007. Persika 14. Paris: 331-351. Tilia, A. B. 1978. 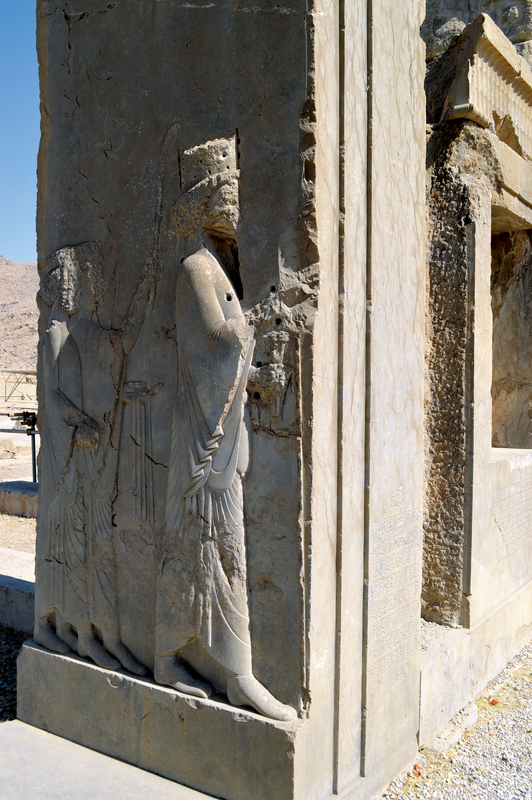 Studies and Restorations at Persepolis and Other Sites of Fārs, II. IsMEO Reports and Memoirs XVIII. Rome.